cpd2009 Wrote: Did you have a good Thanksgiving holiday? By the way, how often does Thanksgiving is celebrated each year? I somewhat feel the last one was not too long ago. RAMChYLD Wrote: Slot machines run Linux! Who knew! In the USA, one of the major casino companies is IGT, and I know for a fact that their video slots are PC based. As for what OS they run, I'm not sure. Could be Linux, but I also have a hunch it could be Windows XP Embedded. Yeah, I was at Genting Highlands again yesterday. Aunt managed to score a free room. Uh, I think they're supposed to only celebrate it once a year? RAMChYLD Wrote: Uh, I think they're supposed to only celebrate it once a year? I could have sworn the last one before this was not too long ago. Well, maybe I should say "Time flies" then. That would be Thanksgiving in Canada, which is the second Monday in October. US Thanksgiving is on the fourth Thursday in November. Looks like my old friend Agent0042 is stirring back to life. His Amazon.com account suddenly became active again at the end of September with reviews dating to just a few days back. This further proves he is still alive and well, but what does this mean? Does this mean he will slowly return to Yahoo Messenger and restore contact with all of his friends that are still worried about him? Or will he continue to ignore us for unknown reasons? Let's turn our attention to another related topic.... replacing old computers that really could have been saved with a simple reinstall of the OS. Agent recently got a new laptop, a Gateway Windows 8 one as evidenced by his latest review of said laptop. Before the Gateway, he had one of those small "HP Mini" netbooks from around 2010 or so, and last I heard before he disappeared, he was fine with it. His review mentions that he bought the new Gateway laptop because the old netbook was becoming "slow, clunky, and generally out of shape". Agent is not as technically minded as me, David, or Blake, so buying a new laptop to replace a slowing netbook can be understandable. Still, I wish he was technically minded as us at times. He doesn't give any sort of detailed evidence on his old netbook's performance, but by the way it sounds, I think the HP Mini could have just used a simple reinstall of Windows 7 Starter, and I think Agent did have an external DVD drive for it. I could be wrong though. It's also possible that technology has evolved so much in just those three years that his netbook's Intel Atom processor can't keep up anymore, or that he discovered that the programs he was using required something a lot faster, like when I found out Wendell was too slow for my needs. (he is a music PC now in case you are wondering). Or, the netbook's Windows 7 Starter setup may have just become clogged over time with all sorts of junk and leftovers that are slowing the system down. There are times when you genuinely need a new computer (like replacing a Gateway computer from 2006 with a dying motherboard), but there are also times when people replace computers that are just two or three years old because they are getting slow, and those people don't have the knowledge to know that a simple refresh of the OS is all that is needed in most cases. Sometimes, even dual-core laptops from as far back as 2006 can still be useable if they are regularly maintained. If people like Agent knew that, they could save money by keeping their current laptops up to speed with regular maintenance and malware/antivirus scans. All computers, a few years old or current, will inevitably become outdated and slow as technology continues to evolve and parts will fail, but it's still worth it to try and keep your current computers up to speed as long as possible. Reminds me of Jasper... which was Agent's old desktop computer system. I bought it from him a few months after he got a new desktop PC since I believed it could be salvaged, something Agent actually questioned. And I was right. I got about three more years of use out of it, and became known as Jasper in the long run. He still serves me somewhat, as I salvaged his 160gb hard drive into a portable enclosure for data storage. Agent, if you ever come across this site and read this, can you explain why you have been ignoring me, David, and all your friends at that Final Fantasy forum? Did we do something wrong? - My trusty Timex analog watch I got for Christmas last year. Still running great, though the band is starting to show some minor wear. Still nice looking though. - The legendary Casio CA-53W digital calculator watch. 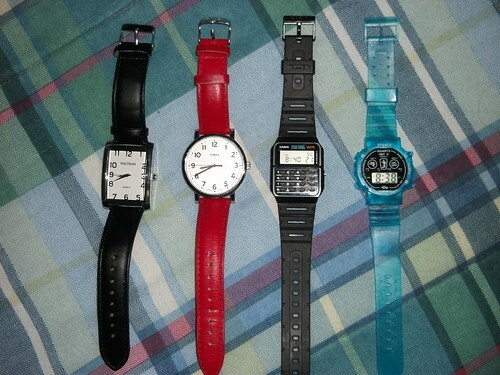 Before I got the Timex, this is the one I always used to wear. - Lastly, a cheap $1 translucent blue watch from Dollar Tree. Very basic with a very flexible band and plastic buckle. Might not withstand general wear, but I keep it around if I want to wear a blue watch one of these days. Good to hear that Agent is becoming active again I guess. Maybe it's just a matter of time before he gets on Yahoo Messenger again. I would have posted something last night, but I was feeling tired and had a bad case of indigestion. Not good. I have been watching Yumurcak TV (Turkish Kids TV) again, and they show Caillou. A LOT. They also hack n' slash Arthur so they can fit in four stories in a half hour or so. 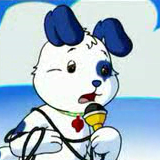 I saw "Binky Rules" and could easily tell some parts were cut. They also adore Captain Tsubasa, showing two or more hours worth per day. Captain Tsubasa is a Soccer anime, so there's that. Right now, I'm watching some sort of infomercial that shows off a Turkish Caillou PC game, some Hello Kitty stuff, and other products. XtremeTab Website Wrote: The Resistive Touch Screen delivers the most advanced touch screen technology available. It responds to a wide array of gestures including tapping and swiping. Another tablet Kmart had on sale was a 9'' "4Sight" tablet. I never heard of 4sight, and thanks to eBay, I managed to find their website: <!-- m --><a class="postlink" href="http://www.4sightCE.com">http://www.4sightCE.com</a><!-- m -->. The pictures of the tablet on eBay make this tablet seem like shanzai stuff. The box has the typical cheap looking graphics, mismatched fonts, and an outrageous label on the back that states the MSRP is $300.00!! That makes the tablet sound even more questionable. What is funny is that when you go to 4sight's website, you will find out that the manuals for their products are hosted on Google Docs! Their website is even hosted on Google too! Since I already have Daffodil, I don't need to buy this tablet from eBay. I am viewing Yumurcak TV through a site called Kure.TV. It streams alright through there, but I need to find a way to rip the stream as the infomercials on there would make great YTP material. I was looking for a show about a family of rabbits, but I am not seeing it at all. Instead they show some odd "Olliver's Adventures" and "Marsupilami" during the time it ran back in 2010.